One by one, Jody, Margaret, Alana, Angel and Joyce are called to come to the corner of the classroom. Each of them firmly grips a pair of long-handled tongs to their clay creations and gently dips the piece into a deep bucket of liquid. 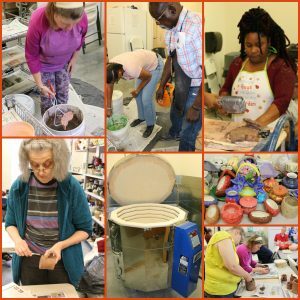 The Monarch’s Creative Arts and Community Center (MCACC) participants are completing an important step in creating pottery. MCACC’s pottery workshop, tucked away at the end of the hallway, is a bustling room of eager artists. Pottery creations are arranged on the shelves in varying stages of the creative process – some in the familiar terra cotta color while others are covered in bright hues. Day program participants wait patiently for their turn to transform their ideas from the initial piece of clay into mugs, bowls, vases and covered dishes. The center’s course offerings in addition to pottery include art, dance and music programs for the 60 adults with intellectual and developmental disabilities who attend. The current MCACC kiln is a newer model since the class began three years ago thanks to a 2016 grant from the John W. Roffe and Marjorie A. Roffe Endowment for Moore County, managed by the Moore County Community Foundation. Sizable pieces can now be fired, as well as accommodate different clays and glazes. This kiln’s firing process allows for finished pottery to be dishwasher and microwave safe. In addition, MCACC received a generous donation from the Donald and Elizabeth Cooke Foundation in late 2017 to further support the pottery program. This donation helped expand MCACC’s capacity to teach pottery on-site and allow participants with an interest in pottery to take classes at the North Carolina Pottery Center in Seagrove. The contribution also supported the development of an art gallery to showcase pottery and other artwork made by people we support. The grant also allocated funding for Developmental Specialist Enjoli Allbrooks to complete pottery courses at MCC so that she may share expertise with the people we support and creation of a pottery gallery within MCACC. MCACC will introduce their new pottery and art gallery, “Monarch Gallery: Where Art Takes Flight,” during a community open house from 5:30 – 7:30 p.m., Thursday, November 1 at MCACC, 1662 Richards St., Southern Pines, North Carolina. The Moore County Chamber of Commerce will conduct a ribbon-cutting at 5 p.m. The public will have an opportunity to shop and purchase pottery made on-site.